The sizes and distances of things in space are awe-inspiring, but hard to fathom. Things that are unimaginably massive can look tiny to us from Earth, and things that appear very large to us may be among the smallest in the sky. Although students can learn names and features of objects in the night sky, scale is one of the biggest stumbling blocks they need to overcome to actually understand what they’re looking at and to understand astronomy in general. But students have lots of daily life experience with bigger things looking smaller because of relative distance (and visa versa). 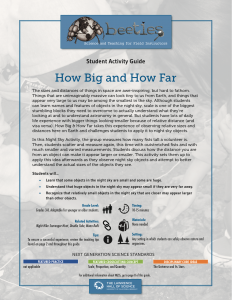 How Big & How Far takes this experience of observing relative sizes and distances here on Earth and challenges students to apply it to night sky objects. In this Night Sky Activity, the group measures how many fists tall a volunteer is. Then, students scatter and measure again, this time with outstretched fists and with much smaller and varied measurements. Students discuss how the distance you are from an object can make it appear larger or smaller. This activity sets them up to apply this idea afterwards as they observe night sky objects and attempt to better understand the actual sizes of the objects they see. Learn that some objects in the night sky are small and some are huge. Understand that huge objects in the night sky may appear small if they are very far away. Recognize that relatively small objects in the night sky that are closer may appear larger than other objects.